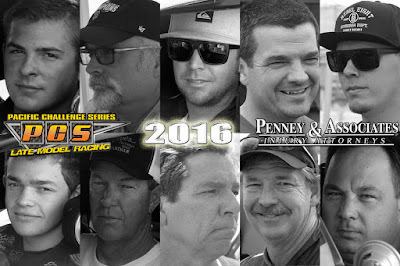 SACRAMENTO, CALIFORNIA (January 18, 2016) - The 2016 Pacific Challenge Series presented by PenneyLawyers.com banquet is this Saturday, January 21st at Cattlemen's Restaurant on Taylor Rd in Roseville, CA. Doors open at 5 p.m. with dinner at 6 p.m. and awards presentations to follow. Tickets are just $25 and include a menu option of steak, ribs, chicken, or ravioli plus 1 free adult beverage. For ticket ordering, please contact Penney Racing Supply at 916-338-3434. WENATCHEE, WA (January 16, 2017)–Drivers, fans and officials of the Northwest Super Late Model Series came together Saturday evening at the Wenatchee Convention Center to honor series champion, Garrett Evans, in addition to eight men and one young lady that made up the final top-10 points standings for 2016. Speed 51’s Most Popular Driver of the Year award for the NWSLMS was presented to Brittney Zamora. The Kennewick native received over 50 percent of the overall vote total to earn the honor. Zamora made several trips to the stage as she collected the 2016 Jefferson Pitts Racing Rookie of the Year award and hardware for finishing fourth in the series points standings. Her points finish earned the high school senior $3,000 in cash and contingency awards from Racing Dynamiks and the series. Zamora, who’s Rookie of the Year award includes a test session with Jefferson Pitts Racing’s NASCAR K&N Pro Series team, will begin her 2017 season on Feb. 4 competing in Tucson Speedway’s famed Chilly Willy 150. Shane Mitchell (10th place), Dirk Bennett (9th), Clint Habart (8th), Glenn Knutson (7th) and Ed Thomsen (6th) were the first group of drivers to receive trophies and over $3,500 in points fund checks in addition to over $2,000 in contingency awards from Frank’s Radio (Bennett), Five Star Race Bodies (Knutson) and AR Bodies (Thomsen). 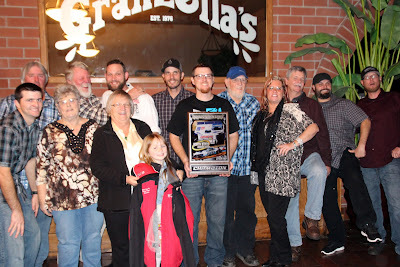 One of 2016’s most exciting drivers on the series, Ryan Wells, who finished in the fifth place position, was awarded $1,000 from the points fund and a $900 graphics package from Accelerated Graphics. The Hingham, MT driver maintained a presence inside the top-5 in the championship standings throughout the season. Wells is a past champion of Montana Raceway Park. Mitch Kleyn continued his successes on the NWSLMS as the Quincy, WA native earned his third consecutive top-3 points finish on the series. An alliance with Racing Dynamiks during the off-season paid off as Kleyn’s Wild 1 Racing Team had several top-5 and top-10 finishes en route to the third-place points finish. Braeden Havens had a breakout season on the NWSLMS as the Medical Lake driver scored his first series victory (August’s ID 200) and consistently ran among the top-10 drivers at each stop the series made. The 2016 season marked Havens first full-time venture on the NWSLMS after running partial schedules in 2014 and 2015. Havens will be back this year to challenge for the championship in a brand new car built by Racing Dynamiks. Evans picked up his third consecutive series championship on the strength of four main event victories. In seasons past the East Wenatchee driver was the model of consistency with top-5 finishes, but had yet to break through for a series main event until last spring’s 50th Annual Apple Cup at Yakima Speedway. Led by crew chief, Brian Andrus, the famed No. 64 Chevrolet became the dominant race car of the region as Evans was a threat not only at NWSLMS events, but challenged for victories in the 2016 Summer Showdown at Evergreen Speedway and nearly captured his second Montana 200. The Northwest Super Late Model Series Inc. is the premier regional touring Super Late Model series in the Pacific Northwest. The series has many valued sponsors including Hoosier Racing Tire, McGunegill Engine Performance, Port City Race Cars, AR Bodies, Joes Racing Products, Accelerated Graphics, Five Star Bodies, Longacre Racing Products, Wheel Chill, KRC Power Steering, Racers Against Child Abuse, Atomic Screenprinting and Embroidery, Franks Racing Radio, BLP, Jefferson Pitts Racing and Racing Dynamiks. HAVASU 95 SPEEDWAY. 1/4 MILE PAVED OVAL. LAKE HAVASU CITY, AZ. www.havasu95speedway.com SATURDAY, JANUARY 21ST. The Havasu 95 Speedway will open its spectator gates this Saturday afternoon for the latest round of their 2016 - 2017 winter racing series. The quarter mile paved oval is located within the SARA Park complex in beautiful Lake Havasu City, Arizona. It's Snowbird Appreciation Night at the speedway. All official snowbirds will receive a $2 discount on their race tickets. The front gates will open at 12pm with the racing starting at 2pm. Fans are invited to attend the special happy hour, from 12 to 130pm, where $2 drafts will be served in the Beer Garden. Providing the on track action will be the Get It In Gear Street Stocks, running twin 40 lap main events, along with the Office Cocktail Lounge Bandoleros, the Flowers Assisted Living Team Factory Stocks and the Sam Nichols Electric Factory Stocks who will be racing on the speedway's infield dirt course. It's becoming increasingly apparent that the Get It In Gear Streets Stocks are going to finish the winter season with a highly competitive championship run. Going into Saturday afternoon twin main events, there are only 18 points separating the top five drivers. With one feature win, two seconds and a third place finish, the very consistent Tyler Savage goes into Saturday as the with 197 points. However, he's only five points ahead of Garrett Reinoso who has a consistent four top five finishes. Speedway veteran Bobby Keirns, a feature winner this season, is ranked third in the standings 13 points out of first. Ranked fourth, 16 points away, is Gavin Bucy who has a feature win, a pair of top fives and a top ten finish. William Guevara, another feature winner, completes the top five 18 points out of first. The Sam Nichols Electric Factory Stocks will abandon their usual paved oval race this Saturday and will instead race on the speedway's one-eighth mile dirt infield course thereby adding to their usual level of racing excitement. Three time main event winner Jeff Prieur goes into Saturday afternoon leading the Factory Stock standings with 303 points. He holds a 22 point lead over Chris Blackwell in second and is 26 points ahead of feature winner Jose Guevara. The Flowers Assisted Living Assisted Living Team Factory Stocks is a concept featuring three rotating drivers. With two feature wins, Team EWWWWEEEE leads the division standings with 108 points. Team Take and Bake along with the Vista Cruisers are tied for second 13 points away from the leaders. The Asphalt Junkies holds down fourth 14 points out of first. Two time main event winner Madision Gay leads the Office Cocktail Lounge Bandoleros standings with 240 points but only commands a six point lead over Brock Rogers himself a feature winner. Also a factor here is main event winner Cody Kiemele who holds down third in the rankings just 12 points out of first. General admission tickets, age 17 and up, are $12 and $10 for seniors, age 55 plus, military personnel and the handicapped. Kid's tickets, age si to 16, are $6. The speedway also offers a budget friendly family package, for $25, that admits two adults and two kids age six to 16. Fans are also invited to enjoy the special amenities of the speedway's VIP section, for $25, featuring the best seats in the house. For more information regarding the speedway's winter racing series dial up their website at www.havasu95speedway.com or visit their Facebook page. EVERGREEN SPEEDWAY. 3/8 & 5/8 MILE OVAL WITH INTERLOCKING INFIELD TURNS. MONROE, WA. www.evergreenspeedway.com SUNDAY, JANUARY 22ND. The Evergreen Drift Winter Series will treat its fans to its tire burning, riding slide ways, action this Sunday. Evergreen Drift is your place to experience the excitement of drifting at its best. Home to the Northwest Grassroots Championship series and the only Formula Drift ProAm Affiliate series in the Northwest; we are one of the few venues in North America where you can go from a beginner to earning your professorial license without ever going to another track. IRWINDALE SPEEDWAY. 1/8TH MILE DRAG STRIP. IRWINDALE, CA. www.irwindalespeedway.com THURSDAY, JANUARY 19TH. Once again the Irwindale will be converting a portion of their half mile oval into their drag strip in order to present their famed NHRA Thursday Night Thunder drag racing program while proclaiming the message: "race the strip and not the street. This program is open to all cars from professional dragsters to the car you borrowed from Mom and Dad to get to the drag strip. The spectator gates will open at 4pm followed by drag racing from 5 to 10pm. Entry fees are a budget friendly $20 to race all night and $10 to watch the racing. Williams, CA. January 14, 2017 - The third annual awards banquet honoring the top ten drivers in the 2016 North State Modified Series, presented by Protect the Harvest, (NSMS) was held Saturday night at Granzella's Banquet Facility in Williams, CA. Business Manager Nadine Strauss acted as master of ceremonies and speeches were given by series co-promoters Jeff Stephens and Bob Strauss. Darrin Knight of Kelseyville was crowned NSMS champion for the second consecutive time. Knight was the Wenteq hard charger twice, the fast qualifier 3 times, and laid claim to 3 main event victories during the season. He followed that up with five other top-5 finishes. Second place honors went to Charlie Collins of Upper Lake. Collins captured back-to-back events at Ukiah Speedway and All American Speedway. He was a three-time recipient of the Sunoco/Penney Racing Supply Fast Qualifier award. Other than his 2 wins he had 3 -2nd place finishes and 2 other top 5's. Third overall was Darrin Sullivan of Kelselyville. He was also the winner of the 2016 Sunoco Rookie of the Year Award. Mike Collins of Nice chalked up fourth place. Collins will be taking a break from racing next year to help out on Sullivan's pit crew. Fifth place went to Codi Barba of Cobb. Barba supported both an NSMS modified and a Nor-Cal Pro-4 modified last year. Sacramento's Jason Philpot finished sixth and was noted as the “winningest” driver with four NSMS victories in 2016. Sierra Furia of Lakeport finished in seventh place and earned the Most Improved Driver award. She finished in the top 10 six of the 8 races that she ran. Veteran driver Richie Potts of Petaluma was eighth. Rich Cobb of Klamath Falls, Oregon was the ninth place finisher, and tenth went to Nick Lyons of Loomis. Recognition went to the series sponsors including Protect the Harvest, Lucas Oil, Sinister Diesel, Wenteq High Performance Race Car Parts, Swartz Diesel, Penney Racing Supply, American Race Tires, WrapStar Pro, 5-Star Bodies, DJ Safety, Sunoco Race Fuels, Naake Suspension, Buckhorn Bar & Grill, Scribner Plastics and Renner Petroleum.